Damn right it’s fragile – protect them for meeeeeee ! Moving house yey, Hope it all goes smoothly, Either that or you have a serious McDonalds addiction! don’t envy you if you are moving house after moving across the world I never want to move again! oooh where are you going? exciting! Just the next road, but it’s our first house. Not exchanged contracts yet but trying to be prepared. Rather you than me. I HATE moving! How exciting! Looks like you are very well organised. I’m dreadful at packing, even for holidays let alone moving. Good luck with it all! Ooh don’t envy you, I hate moving. Well really I hate the packing! ohh house moving stressful but exciting at the same time! Oh I don’t envy you this task! Hope it all goes smoothly. EEK! Moving house!! Hope it goes well!! Dreaded packing. Lovely when it’s all done. 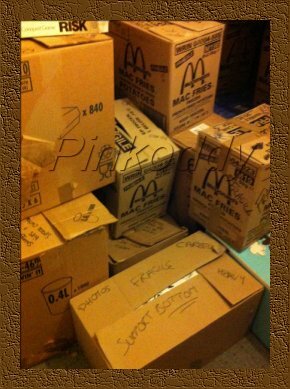 You must have eaten an awful lot of mcfries to get those boxes! Fragile bottom?! Happy moving day! Hope all goes well. We still have boxes around – we moved 7 weeks ago now.